In the history of American literature, James Fenimore Cooper played a substantial role in the development of American fiction and the American character (McWilliams 20-21). During his own time, Cooper influenced public opinion on many important political issues, especially those relating to the Native Americans, and especially the Indian Removal controversy of the 1830s (McWilliams 84). Of all of his writings, however, The Last of the Mohicans,1826, second of the Leatherstocking series, had and continues to have the greatest impact. TLOTM--never out of print, translated into almost every major language, the subject of four movies--is simply a novel that "everyone knows something about, even if one has not read it" (McWilliams 11-12). In short, TLOTM is an American myth, an American myth that is especially important in the way that it represents Native Americans and the American landscape. Probably because of his conception of the landscape as a character in TLOTM, Cooper "began to cultivate the art of landscape with a resourcefulness not evident in his earlier romances" (Nevius 14). Cooper's dramatic portrayal of landscape inspired various American painters interested in "conveying the immensity of unspoiled nature" (McWilliams 12), such as the Hudson River School--Thomas Cole, Asher Brown Durand, Thomas Doughty, Frederick Church, Jasper Francis Cropsey. "As in many a Hudson River School painting, Cooper's novels repeatedly set up a character as the feeling observer of a landscape that is described in detail, either by the character or by the narrator" (McWilliams 29). And, I would like to argue that Thomas Cole, like Cooper, set up the American landscape as an important character in his imagining of the development of the American continent. Considered one of America's first great painters though he grew up in Britain, Cole was alarmed that industry would mar America's majestic landscape as it had done there. Cole's "art introduced a new chapter into American artistic history, one in which nature, specifically the wilderness, captured the American imagination and became a new national symbol . . . . Nationalism and Romanticism came together in the first quarter of the nineteenth century to inspire important new developments in literature and painting . . . landscape [emerged] as a metaphor for the new country" (Powell 9-10). This nationalism and romanticism is an evident link between the work of Cooper and Cole, most especially when considering Cole's TLOTM paintings. Cole's TLOTM paintings consisted of three major works: Scene from The Last of the Mohicans: Cora Kneeling at the Feet of Tamenund (1827), Landscape Scene from The Last of the Mohicans(1827), and Landscape with Figures: A Scene from The Last of the Mohicans(1826). This last painting depicts the death of Cora and Uncas. The first painting is very similar to the second, and both display the action taking place in Chapter 29 of TLOTM. In this scene, Natty Bumppo and his companions are prisoners in the Delaware camp. While the chapter begins with a shooting match to determine the true "la Longue Carabine," the major focus of the chapter is on Magua and Cora as they plead their opposing cases in front of Tamenund, the patriarchal tribal leader, as well as the rest of the Delaware tribe. Cole's painting based on this chapter was, very significantly, "perhaps the first major American painting to illustrate a scene from an American novel in a landscape considered typically American" (Baigell 40). 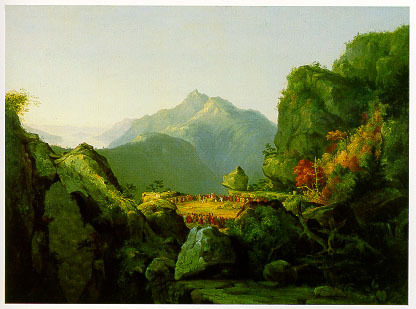 It is no mistake that the landscape plays such a major role in Cooper's novel and scene as well as in Cole's painting. Novel, scene, and painting make explicit the fight for control of the land that was at the heart of the formation of the American frontier. As I stated earlier, from the beginning Cooper comments upon the quest for control of the frontier land by the French, British, and Native Americans. And throughout Cooper shows the massiveness of the land in constant contrast to the smallness of the individuals struggling to make their way on this land. "Whole armies are swallowed up in the living mass of dense vegetation only to emerge as broken and scattered remnants . . . and the entire struggle . . . seems trivial" (Ringe 26). Along with Cooper's characters, readers often find themselves immersed "in the midst of huge rocks, and over-hanging woods, and tumbling cataracts, with a great mist, and a great noise, and . . . utterly unable to settle the relative position of these objects, so as to form any distinct picture from them in the mind" (Gardiner 156), dwarfed by a wilderness that threatens to consume. Thus, of all the scenes that Cole could have chosen, he chooses to recreate the action from Chapter 29 which focuses on the Native Americans' loss of the land. Although the chapter opens with a shooting contest and proceeds to impassioned speeches by Magua and Cora both seeking "justice," the focus is on Tamenund's judgment, a judgment that is entangled in his feelings about the loss of Native lands. Magua may lecture on God and his relation to men colored "blacker than the sluggish bear," to men "with faces paler than the ermine forests, and to men "made with skins brighter and redder than yonder sun" (300-2), and Cora may pray to Tamenund "the father--the judge . . . the prophet--of his people"(343), but the answer to all comes from Tamenund. That answer reflects his awareness of the Natives' loss of land: "It was but yesterday . . . that the children of the Lenape were masters of the world! The fishes of the salt-lake, the birds, the beasts, and the Mengwe of the woods owned them for sagamores" (305). Upset that the "palefaces" have greedily laid claim "to have the earth" (305), Tamenund attempts to give justice to other natives. And, as in most of Cooper's novel, we are drawn into the action and turmoil of the characters and their drama, a drama that is concerned with the control of the very wilderness in which the characters and readers find themselves immersed. her. Tamenund, committed to a warrior's right to his war prisoner . . . In TLOTM, Cooper creates a world where nature towers over man and his dramas, and God, if such an entity exists, remains aloof from human concerns. Cole creates a similar world but rather than being embroiled in the human conflict, he uses his paintbrush to remove us from such a world. "The distant human figures in Cole's two paintings from The Last of the Mohicans . . . all but lost in the grandeur of the natural setting and subordinated in the design to the curious rock formations which Cole, like Cooper, was addicted, testify to the insignificance of the human drama (Nevius 122). While the dwarfing of individual figures in Cole's painting follows traditional Romantic standards, this idea of human figures being for the most part anonymous is special to Cole and seems to suggest humans' ultimate loneliness and insignificance in the world (Koppenhaver 183). Yet, in Cole's painting, unlike Cooper's novel, we see things from a different point of view. Rather than being immersed, the viewer's "eye" looks down on the action, giving the viewer a God-like feeling. With that feeling comes a certain detachment from the human action and, at the same time, a connectedness to the vastness and ultimate superiority of the natural world. The vast natural world stretches beyond man's comprehension. Beyond man's ownership. "Never before had an American artist captured so completely the look and feel of raw nature as well as the apparent total indifference of nature to man's presence or intentions" (Baigell 11). In attempting to define the American experience, Cooper and Cole suggest that man, whether Anglo or Native, is not among those eternal things. Barker, Martin, & Roger Sabin. The Lasting of the Mohicans: History of an American Myth. Jackson: UP of Mississippi, 1995. Bercovitch, Sacvan, ed. The Cambridge History of American Literature: Volume One: 1590-1820. Cambridge: Cambridge UP, 1994. Berkhofer, Robert F. The White Man's Indian. New York: Vintage Books, 1978. Gardiner, W.H. "Coopers Novels." North American Review 23 (1826): 150-201. Kasson, Joy S. Artistic Voyages. Westport: Greenwood, 1982. ---. "The Voyage of Life: Thomas Cole and Romantic Disillusionment." American Quarterly 27(1975): 42-56. Koppenhaver. Allen J. "The Dark View of Things: the Isolated Figure in the American Landscape of Cole and Bryant." Views of American Landscapes. Ed. Mick Gigley. Cambridge: Cambridge UP, 1989.183-98. McWilliams, John. The Last of the Mohicans: Civil Savagery and Savage Civility. New York: Twayne, 1995. Nevius, Blake. Cooper's Landscapes: An Essay on the Picturesque Vision. Berkeley: U of California P, 1976. Parry, Ellwood C. The Art of Thomas Cole: Ambition and Imagination. Newark: U of Delaware P, 1984. Powell, Earl A. Thomas Cole. New York: Harry N. Abrams, Inc., 1990. Slotkin, Richard. Introduction. The Last of the Mohicans. By James Fenimore Cooper. New York: Penguin, 1986. Wolf, Bryan J. "A Grammar of the Sublime, or Intertextuality Triumphant in Church, Turner, and Cole." New Literary History 16.2 (1985): 321-41.